SAHIL's highly affordable Instant Start Metal Halide Plate Exposure are designed to ensure fast, consistent exposures and superior image reproduction on P.S. Plates, Conventional Plates, Proofing material and Textile printing. The instant-start power supply saves energy by eliminating warm up and idling times. It is available in 1 KW & 3 KW Lamps to suit your variable speed and intensity of exposure requirements. The light source has a uniquely designed imported reflector to give uniform lighting over the entire plate area. Microprocessor based light integrated electronic timer has a 20 channel memory with dual vacuum system with single vacuum pump. Useful handy drawers are built in for storing films, flats & pre - sensitized plates. 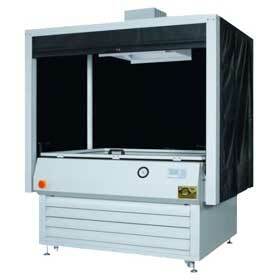 The system has a diffusion screen (Optional) with extra exposure to facilitate to deletion of tape marks in paste- up jobs.